As an operator in the field, you want gear that is dependable and durable able to take on the toughest of missions. 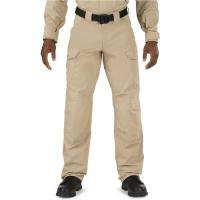 Introducing the Stryke TDU Pant from 5.11 Tactical. This TDU Pant allows full mobility due to the flex-tac fabric which stretches with every movement and the fully gusseted crotch. Coated with Teflon®, the 5.11 Tactical Stryke TDU Pants will resist spills, stains, and soil keeping you dry in no time. You can store many of your everyday accessories in strategically placed cargo pockets on each side. The articulated knees are double layered and are compatible with the 5.11 Tactical's knee-pads. With its professional appearance, lightweight material, highly mobile, durable, and reinforced construction, the Stryke TDU's from 5.11 Tactical will insure you won't get drag down in the mud (the Teflon® treatment will take care of the mess) and keep you going during your entire shift! Dark Navy, 34" , 32"
TDU Green, 36" , 34"
Dark Navy, 32" , 32"
Dark Navy, 42" , 32"
Dark Navy, 34" , 30"